At 3 to 4 inches long, the hummingbird doesn't need much nesting space. A hummingbird nest is quite small -- usually about the size of a walnut -- so it's easy to overlook. Plant material, found objects and spider silk all come together to build a nest that grows with a hummingbird family. You may have walked right by a hummingbird nest and not known it because it was so small and effectively camouflaged. When looking for the perfect nesting spot, the hummingbird will buzz right past a birdhouse, which is too confining. Instead, she'll look for a place that's hard for predators to find or access. The perfect nesting spot also offers protection from winds -- a good windstorm can throw her babes from the nest. Temperature is important, too; if the nest gets too warm, the eggs won't hatch, so a spot with shade and some cover from rain is preferred. Usually a tree or shrub works fine. Some hummingbirds locate their nests on platforms of crossed tree or shrub branches, while others will build directly on a single branch. 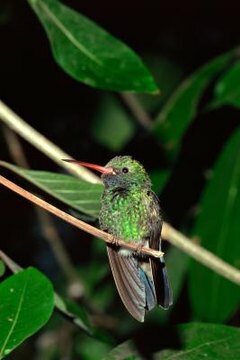 One species, the hermit hummingbird, prefers to build a cone-shaped nest with the bottom supported by a branch. Hummingbirds used to humans may take a less natural approach, building nests in looped cords or wires. Wherever they're building, they'll take care to keep their nests hidden, using sticks and plant parts as camouflage. They know to keep the lighter parts of the nests in the sun and the darker spots in the shade so they don't attract attention. When a nesting site has been established, a female hummingbird scavenges for nest materials. She'll look for soft materials, such as willow bits, soft plant material, leaf hairs, moss and lichen. If she comes across pieces of dryer lint or cotton fluff, she'll add these to the mix. A hummingbird will steal nesting material from another during nest-building season. She'll also covet spider silk, which she uses to hold everything together. Spider webbing allows her to expand her nest as her hatchlings grow. Building a nest is time-consuming work. The mother-to-be spends about four hours a day working on her nest, making more than 30 material runs each hour. The process takes between five and 10 days. It's not unusual for her eggs to be ready for laying before the nest is complete. That doesn't stop her: she lays her eggs and finishes her nest while she incubates them, pressing her neck and chest against the nest to smooth and shape it. A hummingbird builds her nest practically, making a home that has a thick bottom and a thick wind-facing side. The top and leeward side of the nest are thinner, allowing for good air circulation and temperature control. Most resemble small cups, maxing out at about 2 inches in diameter. Such nests will hold up to three half-inch-long eggs. The hummingbird will use the same nest over a long period. How Often Do Wild Quail Hens Lay Eggs?